44 km from Shimla, the capital of Himachal Pradesh, Chail is nestled amidst towering deodar, conifer and pine forests and mist-soaked hills. Situated at a height of 2250 m on the spur of the Shivalik hills, this quaint hill town in the Solan district was developed by Maharaja Adhiraj Bhupinder Singh of Patiala after he was barred from entering the then British summer capital Shimla in the late 19th century. Home to interesting tourist attractions like Chail Palace, the Gurudwara Sahib, Kali ka Tibba, Siddh Baba ka Mandir, Chail Military School, Chail is a perfect destination for a weekend gateway. These attractions of Chail cast a siren-like spell over the tourists who experience its snow-capped peaks of the Himalayan ranges, lush forests and exotic rhododendrons. Commanding breathtaking view of the Himalayan snowline, the relaxing gateway of Chail is an excellent base for idyllic walks and treks into Gaura and Jhaja. The place is also a popular haunt for those willing to avail themselves of the opportunities for angling and horse riding. Chail's claim to fame also lies in the fact that it is home to the highest cricket ground in the world. One can also find a polo ground. For nature enthusiasts and wildlife lovers, Chail Wildlife Sanctuary is the place to be. Here one can spot red jungle fowl, sambar, goral, cheer pheasants, barking deer and Kalijin. 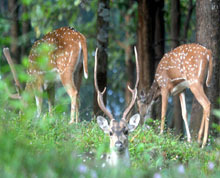 The Chail Wildlife Sanctuary is spread on an area of 110 square km. 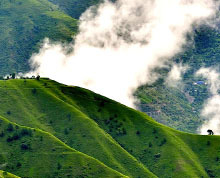 Whether you come to marvel at the towering mountains and pristine valleys, releasing your adventure pursuits, Chail will undoubtedly impress as being just about as close to paradise as it can be possible to get in this world.